Just before we go in, my son makes this heartwarming comment. It’s true that the Canadian Museum of Nature is fabulous. Its architecture, its history, its permanent exhibitions of animals and minerals (among many other things)—what’s not to love? We’re here to visit a part of the museum I haven’t seen before: the solarium, a little slice of tropical bliss in the heart of an Ottawa winter. 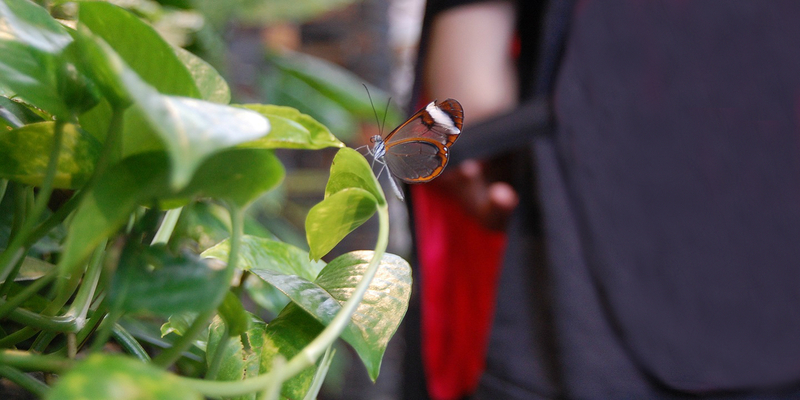 Until April 22, the solarium is home to hundreds of butterflies. Our guide Laurence, who works at the museum, gives us a brief introduction before we enter the solarium. 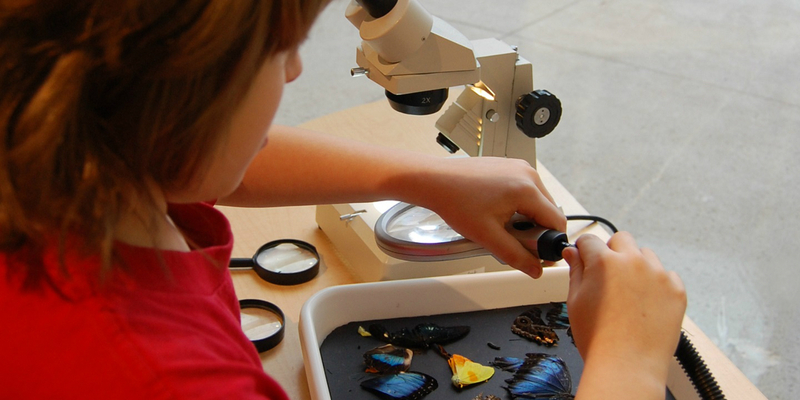 She tells us that every week, a shipment of baby butterflies from Costa Rica arrives at the museum. We can see them through the nursery window, hanging from wooden sticks: beautiful chrysalids, all different. Some look like curled-up autumn leaves, others like golden robots. 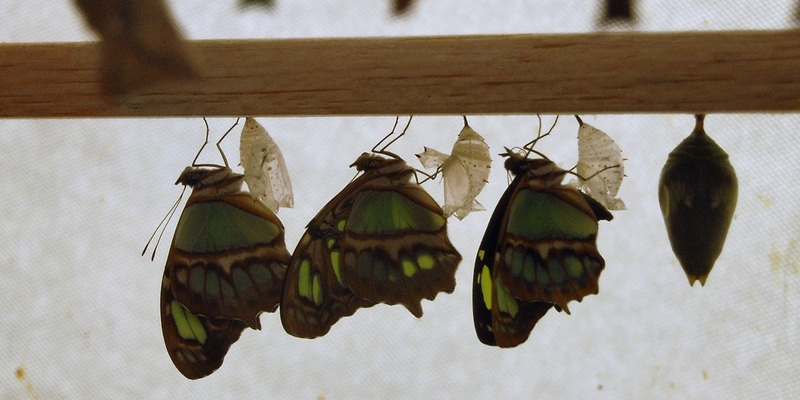 Nothing is stirring, except a few newborns patiently drying their wings. Before we go in, we’re asked to put on a coloured vest. I choose yellow, Lou goes for red. At last the time has come to go into the main gallery. It’s hot. Surprisingly large butterflies fly towards us and flutter past, inches away, as if in slow motion, showing off their blue-tinted wings. My boys can hardly keep from yelling with excitement, and truth to tell, neither can I. Life is teeming all around us, but it’s strangely quiet. What a Zen moment! There’s one simple rule: Don’t touch the butterflies unless they land on you. We keep calm. Slowly and carefully, we explore this lush oasis. There are so many butterflies it’s hard to know where to look. Fruit is set out around the room, and it’s open bar for the insects flocking to it. There’s a surprising diversity of sizes and colours. Laurence points out her favourite: a butterfly with transparent wings! We’re lucky to see it. Lou really likes the monarchs, but Henri cringes from the big butterflies fluttering around him. First spiders, now butterflies: this is a side of him I didn’t know about. 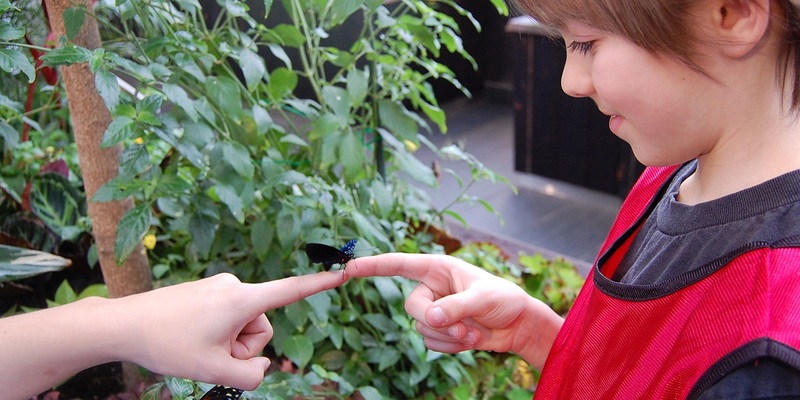 Lou, on the other hand, turns out to be a butterfly whisperer. His red vest seems to be doing the trick: he holds out a finger, and a butterfly gently climbs onto its new perch, while others land on his shoulder and his boot. I’m veeeeeeeeery pleased to observe the calming effect these tiny creatures have on my active boy. Bravo, butterflies, well played. Are you available to babysit Thursday night? As we exit the solarium, we’re careful to make sure no butterflies escape. We’ve all had a great time. This experience is an ideal way to escape the gloom of winter for a wingbeat or two.